Image credit: © Elanna from Flickr. Some rights reserved. Pelage: Tan to grayish body hair; belly and buttocks white. Legs distinctively marked with black and white. Range: Portions of northeastern Africa and the Arabian peninsula. Habitat: Desert mountains. Steep, rocky slopes provide vital routes for escaping predators. IUCN Status: Vulnerable; decreasing population size; assessed in 2008. Population in Wild: No systematic surveys; fewer than 2,500 mature individuals, according to one rough estimate. Locomotion: Walk, run, jump, and climb. Agile—able to navigate steep cliffs. Leap to scale sheer canyon walls. Activity Cycle: Active during the day. Browse throughout the day while temperatures permit. Scale canyon walls to rest during the day and sleep at night. Social Groups: Social. Live in small groups—typically of multiple females, infants, juveniles, and young adults. Diet: Consume grasses, forbes, and shrubs. Predators: Leopard (Panthera pardus), gray wolf (Canis lupus), and striped hyena (Hyaena hyaena). Sexual Maturity: Females mature at about 2 years of age; males at significantly older ages due to social constraints. Litter Size: 1-3 young; 1 typical, though twins are not uncommon. Age at Weaning: Begin solid food by 2-4 weeks of age; weaning complete by c. 6 months. Longevity: Short lifespan in the wild; rarely over 12 years. In managed care, males live about 10 years, females about 11 years. ​Characterized by their prominent, unbranched, and strongly recurved horns. Active in daylight when they browse and graze for grasses, forbes, and shrubs. Often form groups, whose structure and composition is variable. During the seasonal rut, male groups break up and individuals compete, in violent clashes, to mate with females. How to cite: Nubian Ibex (Capra nubiana) Fact Sheet. c2015. San Diego (CA): San Diego Zoo Global; [accessed YYYY Mmm dd]. 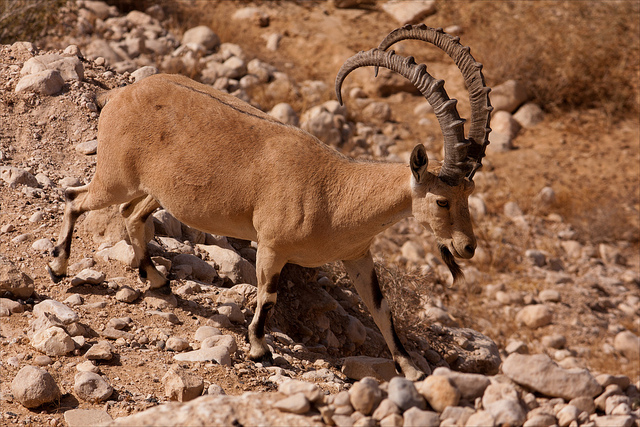 http://ielc.libguides.com/sdzg/factsheets/ nubian_ibex.